Juniper Networks' announcement this week of switches and routers designed to flatten and simplify legacy networks is the latest sign that this company has no intention of backing off in the face of ever stiffer data center competition from Cisco, HP and others. Juniper's rollout takes aim at Cisco's Nexus switches and other data center network wares, while setting the stage for Juniper's Project Stratus, a converged data center fabric unveiled in early 2009 but still another eight to 12 months away from delivery. Juniper is trying to set itself apart by optimizing its product line around increasing use of virtualization technologies within the most compute- and networking-intensive sites. "Virtualization levels the network playing field," says Yankee Group analyst Zeus Kerravala. "The vendor that solves that problem first has a huge upside." The challenge for Juniper is that Cisco's been targeting virtualization from the networking side for several years, while server titans such as HP and IBM -- a Juniper partner in Stratus -- have been tackling it from the compute side even longer.Meanwhile, Brocade points out that it has been building data center fabrics with partners for years and that Juniper remains vague about how it will support legacy storage networks. So Juniper needs to deliver sooner rather than later on the bold pronouncements it made this week, last fall at customer site New York Stock Exchange and over a year ago at the Stratus launch. Early signs are promising. One example: Juniper beat Cisco in landing the NYSE account, a demanding environment in which latency cannot be tolerated when billions of stock market trades are executed daily. Juniper, well known as the No. 2 vendor behind Cisco of routers to service providers, has been gaining steam in enterprise routers and switches as well. In enterprise routers, Juniper is No. 2 to Cisco, albeit a distant second, with 5% share of the $790 million worldwide market in the fourth quarter of 2009 compared to Cisco's 83%, according to Dell'Oro Group. HP/3Com was third at 3%. In Ethernet switches, Juniper has steadily been building market share since entering the business in early 2008. Its share climbed from 0.3% in 2008 to 1.2% in 2009, according to Dell'Oro, allowing Juniper to surpass longtime player Enterasys and Blade Network Technologies, while catching up to Extreme Networks and Huawei. Cisco still has a hold on market leadership though, with about 70% share. Juniper seeks to make more headway by addressing what it sees as a need for a new network architecture optimized for virtualized data centers -- an architecture that increases performance while reducing costs, and facilitates more server-to-server -- rather than switch-to-switch -- interaction. At the heart of this architecture is a reduction in the layers of networking in the data center, from three layers -- access, aggregation and core -- to two and then eventually to one, and that's exactly where Juniper is headed with its Project Stratus. Juniper says that $1 billion of the $4.8 billion spent on data center switching is for aggregation -- the layer Juniper seeks to extract. "The legacy approach can no longer scale to support virtualization," Juniper CEO Kevin Johnson said during this week's Webcast announcement. "Fifty percent of the ports are talking to other network ports" vs. enabling server-to-server interaction, he said. "It's slow." "It's clear to the industry that, because of server virtualization, a new network needs to emerge," says Cindy Borovick, a data center analyst at IDC. "[Juniper's announcement] is a reaffirmation of that, with proof points." Specifically, Juniper this week announced products that can deliver a two-tier data center architecture this year: a 48-port 10G Ethernet top-of-rack switch, a 40-port 10G Ethernet module for the chassis-based EX 8200 core switch and an Ethernet router for interconnecting data centers with ASICs tuned for high-performance support of virtualization, server/storage/network convergence and lossless Ethernet. ASICs and Junos software in all of the new products are designed to support FibreChannel-over-Ethernet (CoE) for storage/network convergence. Junos will have FCoE-specific hooks in it in the second half of this year, Juniper says. Juniper says the top-of-rack EX 4500 has one-fifth of the latency and 22% lower cost than Cisco's Nexus 5000. The EX 4500 is also Converged Enhanced Ethernet (CEE) and Data Center Bridging (DCB) "capable," and 44% more power efficient than Cisco's Nexus 5000, Juniper says. CEE and DCB are emerging technologies and standards for making Ethernet a lossless fabric for the data center, capable of supporting storage traffic -- such as FibreChannel -- for converged storage and server access. 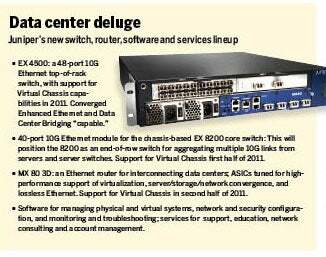 Juniper also unveiled a 40-port 10G Ethernet line card for its EX 8200 core switch. This will position the 8200 as an end-of-row switch for aggregating multiple 10G links from servers and server switches. The new router is the MX 80 3D Ethernet edge services router. It incorporates the Trio chipset Juniper unveiled last fall that's designed to dynamically and simultaneously support more subscribers, services and bandwidth. The MX 3D is designed for virtual machine mobility between data centers interconnected by Ethernet Virtual Private LAN Services (VPLS). VPLS provides a single Layer 2 domain between these data centers, in effect providing the stitching in a cloud infrastructure. This will compete with Cisco Overlay Transport Virtualization data center interconnect technology. Juniper also says the new MX 80 3D Ethernet router takes up half the power and space of Cisco's ASR 1004, while providing an eightfold improvement in performance. Cisco declined to comment on the Juniper announcement. But key to flattening the network architecture is Juniper's Virtual Chassis technology. Currently, Virtual Chassis allows as many as 10 of Juniper's fixed configuration EX switches to be connected into a virtual switch that supports hundreds of Gigabit Ethernet ports. Ostensibly, this will alleviate the three-tier architecture requirement for an aggregation layer made up of several modular switches collecting links from switches in the server racks so that fatter and fewer pipes can run north and south into and out of the data center core. Virtual Chassis will be added to the EX 8200 line in the first half of 2011. It is also expected to be available on the EX 4500 in early 2011 and on the MX 80 3D in the second half of 2011. Coincidentally, the first deliverable from Stratus will be in the first half of 2011. As Virtual Chassis spreads out across more of Juniper's product line, expect to see more tangible Stratus products and deliverables emerge. Stratus will essentially be a scaled-out Virtual Chassis architecture capable of supporting thousands of servers and flattening the EX and MX architecture to look like a single Ethernet routing switch. But analysts expect Cisco to counter. "Our checks suggest Cisco is working on its own Virtual Chassis technology to address Juniper's marketing edge," states Oppenheimer & Co. analyst Ittai Kidron in a bulletin on Juniper's announcement. On the software and services side, Juniper unveiled four Junos Space applications. They are Virtual Control, Ethernet Design, Security Design and Services Insight. Virtual Control includes integration with VMware to manage physical and virtual systems from a common orchestration platform; Ethernet Design and Security Design are intended to enable rapid configuration and deployment of data center networks and security policies; and Service Insight is designed to enable proactive detection, diagnosis and resolution of network issues. Juniper says the new software and Trio ASICs are also designed to support FCoE, a storage encapsulation technology for converging storage-area network and LAN traffic on a single Ethernet infrastructure. Juniper says it will unveil a version of its Junos operating system software for FCoE in the second half of this year. Juniper also rolled out software for its SRX Series Services Gateways that gives IT managers application and user visibility into traffic behaviors and changing data flows driven by virtualization, Web 2.0 and cloud services deployment. This new AppTrack software will be available later this quarter.